Xi Jinping leading the Standing Committee in rank order. It’s official now. 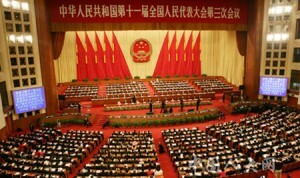 The sometimes deadly jockeying for power has run its course and Xi Jinping has replaced Hu Jintau as President of China. 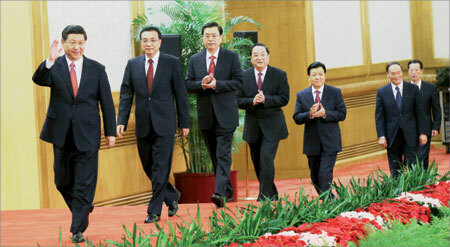 Li Keqiang, who replaces Wen Jia Bao is now Premier. The experts are offering their commentaries and predictions. For example; Hu Jintau’s stewardship of China over the last ten years is seen as a wasted opportunity. Wen Jiabao was all talk and no action. Xi Jinping was a compromise candidate who had no strong qualification for the top job other than that he has kept his nose clean and is a princeling. He and his colleagues in the seven-member Standing Committee (China’s cabinet) have a long ‘to-do’ list which if not attended to may result in social chaos and the implosion of the Chinese Communist Party (CCP). Number one on that list is government corruption. There are doubts about the governing model: Can Xi Jinping and Li Keqiang work together given that they belong to different factions? Will the remaining five committee members cooperate with them given that they are conservative faction appointments? And even though Xi Jinping has the loyalty of the military how can he restrain their aggressive forays into foreign policy? How can he make bold decisions if he is constrained by the need for consensus? These big-picture observations are informative and necessary. They are provided however, by professional China-watchers from academia, government think-tanks, and the international media, who despite their excellent credentials, have limited access to the corridors of power in Beijing. One suspects that they plagiarise each others’ opinions. Perhaps their work could best be described as intelligent speculation. Valuable information as far as it goes, but not the kind of data you would bet your house on. There is another source of information however, that should be added to the mix. Bottom-up opinion from Chinese people themselves. Long experience has taught this group of battlers how to read between the lines and intuit the message behind the message. This is how they keep abreast of the factional battles and policy deliberations which are always going on behind the scenes and which they know will impact on their lives in one way or another. It’s a survival skill. These days, ordinary people around China are sniffing the breeze to see which way the political winds will blow. The Chongqing scandals and the brutal jockeying for positions on the Standing Committee that preceded the leadership changeover have shaken middle China to its core. Middle-class folk smell trouble. Not from any dip in the economy or from the possibility of social unrest, but rather from a loss of confidence in their own government and society. Firstly, they know that many thousands of government officers have been quietly shifting their corrupt wealth offshore, sending their families abroad, before they disappear themselves. Are these so-called ‘naked officials’ rats leaving a sinking ship? Secondly, they are worried about their children and the kind of Chinese society that they will inherit. And thirdly, they are worried about their money. They fear that the government will get its hands on it. Something is happening in China at the grass-roots level. Businessmen are complaining that they are being squeezed by local governments which are hocked to the eyeballs over massive infrastructure projects which will not show a return on investment for quite some time. Local officials have already appropriated peasants’ land for collateral, and have bled them dry. And they can’t sell the land that’s left, because it’s practically worthless. It always has been – its value was inflated in order to get those juicy loans. Now that the county piggy-bank is empty, the middle-class is asking where will the money come from to pay the interest on the huge loans that were taken out to finance these grand schemes? The answer is obvious. They’re the next group to be skinned. Suddenly, my wife and I are being asked if we can arrange to have their children educated abroad, can we help them to buy a house in Australia, and what do they have to do to “get a green card.” These worried folk are preparing Plan B.
I am reminded of the fall of the Communist regime in Russia. Prior to the fall, ordinary Russian folk had been telling foreigners that all the signs were saying that the government and the system could not survive much longer. Yet the professional Russia-watchers from academia, government think-tanks, and the international media refused to believe them. At that time I remember asking myself how could these experts get it so wrong?